Nice little hostel in a good neighborhood in Miraflores. Friendly staff. The double room was spacious and clean, the shared bathroom could use a hand to clean more often as it was quite dirty in the evening, got cleaned in the morning though. Breakfast is decent but nothing special. Hostel with friendly stuff in a good area (international supermarket and bars are close). However the bathrooms were not very clean. The staff does not really know a lot to do around or about bus connections - but if you ask, they look it up for you. Rooms are big with lockers, Clean. Breakfast is okay. I spend three good nights there. I spent one night in Casa Hualpa. It was sufficient for one night, but the beds seem old and unstable. 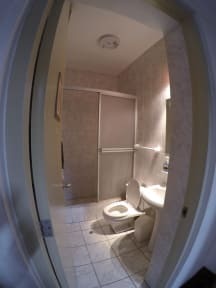 Also there are only three bathrooms for everyone, but they are very clean. The breakfast is fantastic! Also the staff is friendly and helped me with a lot of things! It is a safe place because of the secured door. Only you can't close the lockers in the room. The rooms are small but okay and the staff is helpful. It's hard to find at night because there is no sign at the door, so make sure to remember the exact adress. When we got there, there was no water the first night so that nobody was able to take a shower or use the bathroom. The next day the shared bathrooms were always a bit dirty with hair lying around and water on the floor. However, for a few nights it is alright. Also the breakfast is quite good.